Victron Energy based in the Netherlands have been manufacturing power conversion equipment since 1975 and have become well known around the world for producing reliable off-grid battery inverter/chargers and a wide range of quality, affordable solar controllers. Victron especially shine in the automotive/RV/boating market where micro power systems are common being one of a few high quality manufacturers in this highly competitive market. In recent years Victron's higher capacity battery inverter/chargers, the MultiPlus and Quattro range, along with an array of smart energy management devices have started to compete in the surging home battery storage market with the likes of Tesla Powerwall 2. In the past Victron products have been designed specifically for off-grid installations but with the recent release of the multiplus 2 there appears to be more focus towards home battery or hybrid systems. Victron Energy have possibly the widest variety of solar products of any manufacturer with everything from tiny solar controllers up to a large 15kVA grid-interactive inverter/chargers, not to mention a seemingly unlimited combination of add-ons and accessories to create everything from simple battery monitors to remote AC or DC-coupled off-grid power systems. There are only a few companies which have a reputation for quality in the world of cheap ebay solar charge controllers and this is where Victron Energy really stand out from the crowd. Victron controllers are more expensive than the Chinese competition but you get a hell of a lot more bang for your buck, although the Victron gear is still reasonably priced and in my experience it is definitely worth spending a little more for quality and reliability when working with solar. Besides Victron there are several high quality solar charge controller manufacturers including Outback Power, Morningstar and Australian made Aerl which have been on the market for many years. Personally I had been using the Morningstar controllers for a long time with no problems but recently switched to Victron due to the vast range of products and smart remote monitoring features not offered by Morningstar. Also I am not aware of any other manufacturer besides Aerl which offer a 5 year or greater warranty on solar charge controllers in Australia. Solar charge controllers also known as solar regulators were once the only option for off-grid power systems and are used to create what is known as a DC coupled system – Simply put DC coupled systems use solar controllers to charge a battery directly from the panels which is extremely efficient (up to 99% using MPPT), while a battery inverter supplies AC power to the home appliances. Nowadays most 'large' off-grid installations use solar inverter/s in what is known as an AC coupled system due to the simple setup using grid-tie solar inverters coupled to a battery inverter/charger like the Victron Multi-plus. Common grid-tie solar inverters are available in much larger sizes with higher input voltages (up to 900V) allowing for long strings of panels which are much simpler and easier to install, although this also means it is far more dangerous and can only be installed by trained solar installers. Despite the industry trend towards AC coupled systems Victron don't manufacture solar inverters, although fortunately for larger size systems the Victron Mulitplus and Quattro Inverters are compatible with the well regarded Fronius solar inverters (up to 8.2kW single phase) so this makes a great combination for larger systems. Since home battery systems are becoming popular and MPPT controllers are very efficient at charging batteries, it may result in DC coupling using charge controllers coming back into fashion for certain installations. This is helped with Victron’s latest and largest charge controller, at 100A DC output it allows for an impressive 5.8kW of solar on single controller (at 48V). The down side is that even the largest Victron solar controller is limited to 250V DC which roughly means a maximum of 6 solar panels can be linked together in series (since most panels have an open circuit voltage (Voc) of 37-45V). This isn’t a huge problem for smaller systems up to 3kW but for larger systems it means multiple strings (groups of panels in series) will need to be linked together in parallel which requires more complex string fusing and larger cables to carry the higher current. There are a few higher voltage charge controllers available from other manufacturers such as Schneider Electric, up to 600V, but these are much more expensive. How Victron compares to the competition? Off-grid - Victron is doing very well and gaining some ground in the tough small/medium off-grid solar market against well known battery inverter manufacturers SMA in Germany, Outback power in the US and Selectronic in Australia. These companies have also been building off-grid inverters for many years and have dominated the markets in the US and Australia. In Europe and Africa however Victron is very popular and overall has a more global presence. In the higher capacity off-grid and commercial end of the market Victron come up against the big name manufacturers such as SMA, Schneider Electric and Selectronic who have generally focused on the larger end of the market with a range of advanced AC coupled systems. Hybrid - The hybrid (grid-interactive) inverter market is an area where Victron is developing with more functionality, especially since teaming up with Fronius who manufacture possibly the best grid-tie solar inverters available. However with the multitude of dedicated hybrid and multi-mode inverters already available it will be difficult for Victron to break into this area. The recently released multiplus 2 described below is showing Victron is now pushing into this rapidly growing market. New for 2018 - Victron just released the Multiplus 2 inverter/charger which combines the functionality both the multiplus and multigrid inverter/chargers in a sleek new modern design. The multigrid inverter was the first grid-interactive (grid-tie) inverter/charger released by Victron with the ability to 'island' or disconnect from the grid in the event of an blackout (a safety requirement by electricity network operators). The Multiplus 2 which at this point is only available in one size (3kVA) also incorporates a range of energy management and control features designed for monitoring household energy consumption and providing seamless back-up power in the event of blackout. New look! The old multiplus range of inverters were looking very dated and it's refreshing to see the new modern design released. It's safe to assume this will be the new styling theme for all new Victron inverters/chargers in the future. The range of battery inverter/chargers from Victron is just as impressive as the variety of charge controllers. Victron manufactures everything from a tiny 0.5kVA inverters up to a large 15kVA grid-interactive inverter/charger. Not only do they have a wide range of sizes but also a multitude of devices designed specifically for various applications. For example the compact all-in-one units with inbuilt solar charge controllers are perfect for lighting systems, cabins and caravans. 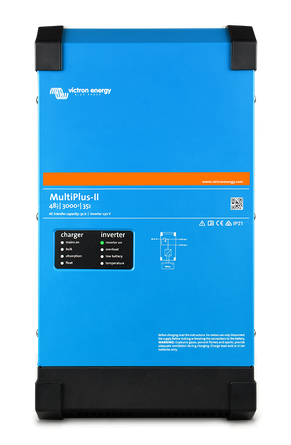 The more advanced Victron multiplus inverters have multiple AC inputs and can seamlessly supply power from the grid or a generator depending on which is active. The large Quattro range of inverter/chargers are designed for high end applications requiring advanced power management and incorporate multiple AC inputs and outputs which can be configured depending on the application. The Multiplus and Quattro inverter/chargers can also be setup in parallel (up to 6 units) for high power output situations or in 3-phase configurations for larger commercial systems. One of the few downfalls of the Victron inverters is the relatively low IP 21 rating (weather rating) which means the inverter/chargers must be installed in a protected area such as a garage, shed or dedicated room. Also as mentioned earlier the only compatible solar inverter for large AC coupled systems is the Fronius range which although expensive are also one of the best solar inverter on the market. One thing to watch out for is Victron size the inverter power output in kVA, not the more common kW (kilowatt) rating. This can be a little misleading when sizing an inverter for you needs; for example a 3000VA (3kVA) continuous power output inverter generally only outputs 2400 Watts continuously, so approximately 80% of the ‘apparent’ power rating. High surge power rating - The surge power rating of the Victron inverters is very good being roughly 2.5 times the rated continuous power output. This equates to a 2400W (2.4kW) continuous output inverter providing peak output of 6000W, although it is not specified how long this can be maintained so I would assume it is only 1-2 seconds, which is enough for the short start-up spikes from pumps, compressors, etc. In the age of smart apps and cloud monitoring the ability to remotely monitor and control a system is becoming essential for both solar installers and end users. With this in mind I would regard the biggest leap forward by Victron as the release of the color control (CCGX) and VRM cloud portal. The color control is simply a small box with a display which connects the Victron VRM internet portal with all the Victron products (inverters, charge controllers, battery monitors etc.) It also allows you to configure and monitor all the individual components directly from the CCGX, as well as logging data and controlling relays. Victron has also made the bold move of making their software open source which means anyone can re-configure the CCGX or reprogram the system to operate on alternative platforms (such as raspberry Pi). This is clever as it enables the people to integrate victron products into unique customised systems. In my experience it was the most seamless and easily configured remote monitoring system I have come across. I personally believe the Victron color control GX outshines the competition including big names like SMA, Selectronic and Schnieder Electric. The biggest downside of the CCGX is the high price which is around AU$800, far more than the competitors. Although Victron just released the ‘Venus’ which is basically the CCGX unit without the display and with built in wifi for around half the price, bringing it inline with the other manufacturers prices. Victron’s battery monitoring units (BMV series) are simple and compact and can be used to monitor everything from a single caravan battery up to large off-grid battery banks for homes or businesses (lead-acid batteries only). Also the addition of an inexpensive blue-tooth unit allows simple wireless setup and monitoring. The BMV together with the unique VE Direct cable interface allows all new Victron products to be interconnected for simple setup, communication, and monitoring of multiple products. Victron also provides multiple data interface converters and cables from everything from common USB to CANBUS. The huge range of Victron solar charge controllers are very will regarded and are some of the best available, especially when it comes to cost and the variety of add-ons available. For small or large capacity DC coupled systems there are not many manufacturers which can compete with Victron's diverse range of products along with the standard 5 year warranty. For smaller scale and mobile systems (below 3kW PV) the Victron Inverters and chargers are of the highest quality and great value for money compared to the many cheap chinese low quality options available. For larger more complex hybrid or off-grid systems the Victron Inverter/chargers are excellent but I wouldn't go as far as saying they are better than the big names like SMA, Selectronic or Outback Power, however if remote web-based system management is critical then Victron is one of the best options. With the growing popularity of solar energy storage and off-grid systems, the need for smart, remote controls and system monitoring will be critical, and it seems Victron Energy are leading the pack in this field. When I setup my solar off-grid home 8 years ago I chose the simple Victron Pheonix inverter as I was on a tight budget and it was one of the few quality, affordable battery inverters on the market. After 7 years of trouble free use I decided to upgrade to the more advanced Victron Multiplus inverter/charger along with the colour control GX remote which turned out to be a very impressive and powerful package. Having worked in the solar/energy storage industry for many years and worked with advanced systems from Selectronic, SMA and Schneider Electric I was so impressed with the easy setup, features and clever remote monitoring that it prompted me to write this review.